The sound of Wintergatan is both beauty and beast. Grand and minimalistic. The Swedish band Wintergatan is about music. And musical instruments. And sounds and melodies. With pounding beats in the bottom end, autoharp and accordion in the middle and Vibraphone, Glockenspiel and Music box towards the high end the sound of Wintergatan is both beauty and beast. Grand and minimalistic. Occasionally the Modulin, a monophonic analogue homebuilt theremin/violin-esque synthesizer dives in singing in the sci-fi key. Being instrumental Wintergatan's music is direct, driven by melodies that catches on and tell tales without using words. 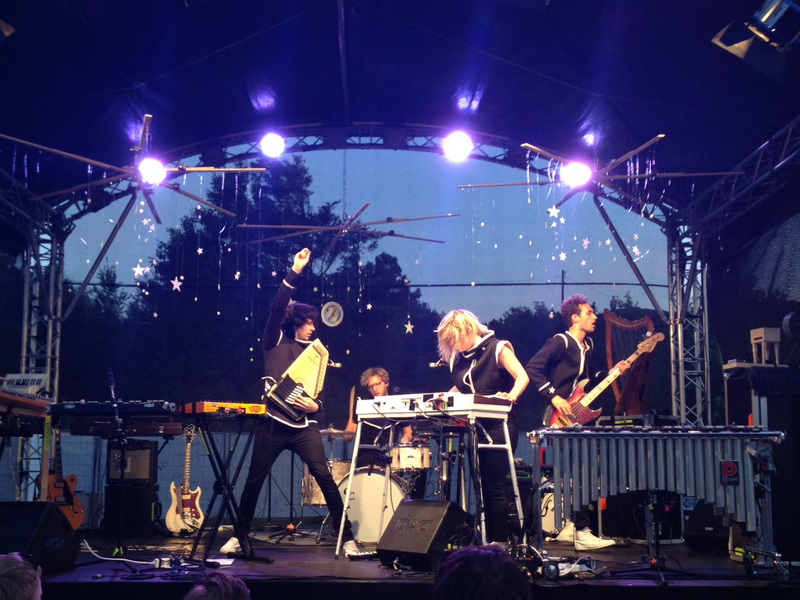 The band's name derives from the recording session where Wintergatan created their debut album in a vast forest in Sweden. Wintergatan is Swedish for "The Milky Way" and on cloud-free nights in the forest, distant from city lights blocking your eyesight you can see how our galaxy lies tilted, as a line crossing the starry sky. This sensation of actually being a part of and in the galaxy gave name to the band. The first thing ever to come out from Wintergatan was the song and video of “Sommarfågel”. “Sommarfågel” immediately got wings of its own and an extensive live tour was booked without anything else released. A second song and video, “Starmachine 2000”, was released shortly after that. Wintergatan then released their selftitled debut album on May 1, 2013, on their own record label. In October 2013 Wintergatan released a single named after Gothenburg´s fastest bike - Tornado. With “Tornado” and another bike related track "Biking is Better", taken from the album, Wintergatan salutes the superiority of bikes as the best inner city transport vehicle. Quicker, cheaper, healthier and more environmentally friendly. Wintergatan´s four members all plays several instruments and if there is a need for a new instrument someone figures out how to use it. It was this approach that first brought Martin, David, Marcus and Evelina together. They all grew up in four different small towns in Sweden - the kind of small towns where you have to come up with something yourself to have anything to do. Unknowingly of each other they spent their time in similar ways making and playing music. Ten years later Wintergatan was born. The instruments that has been used on all Wintergatan releases so far is Music Box, Glockenspiel, Drums, Handclaps, Accordion, Bass, Tambourine, Analogue Synth, Modulin, Vibraphone, Harp, Drawing Pin Piano, Typewriter, Digital Synth, Hackbrett, Toy Piano, Whistle, Drums, Mandolin, Piano, Projector, Melodica, Toy Synth, Autoharp, Tambourine, Electric Guitar, Theremin, and a very lovely Hammond Organ.